MINI Clubman ALL4 – the brand’s first all-wheel drive model in the C-segment. This launch marks the MINI brand’s further advance into the premium compact segment and represents the first ALL4 model to be built at MINI Plant Oxford. MINI’s ALL4 all-wheel drive system, which has previously only been offered on MINI Countryman models, has been specially redeveloped to ensure sportier handling and improved versatility to further enhance the everyday practicality of the new MINI Clubman. 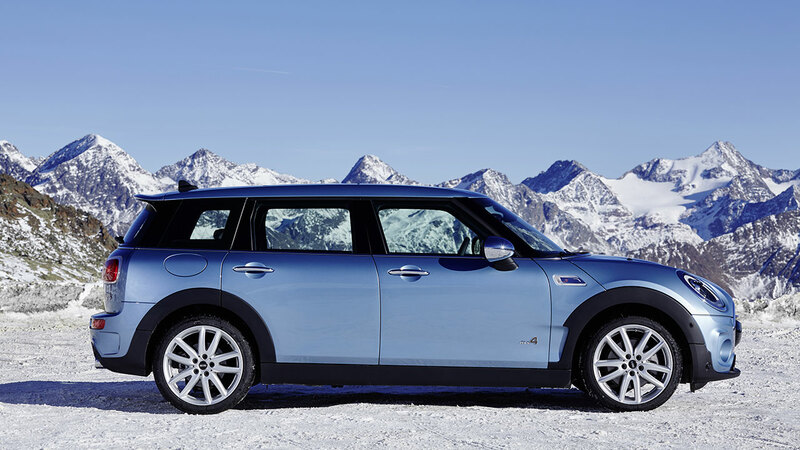 MINI Clubman was launched in October 2015 and is notable as MINI’s first vehicle in the competitive C-segment. Now, the brand is offering something new to the market in the form of Clubman ALL4. Available with two of the latest MINI engines, the MINI Cooper S Clubman ALL4 and the MINI Cooper SD Clubman ALL4. The 2.0-litre 4-cylinder petrol engine with MINI TwinPower Turbo Technology is the latest example of MINI’s engine technology. 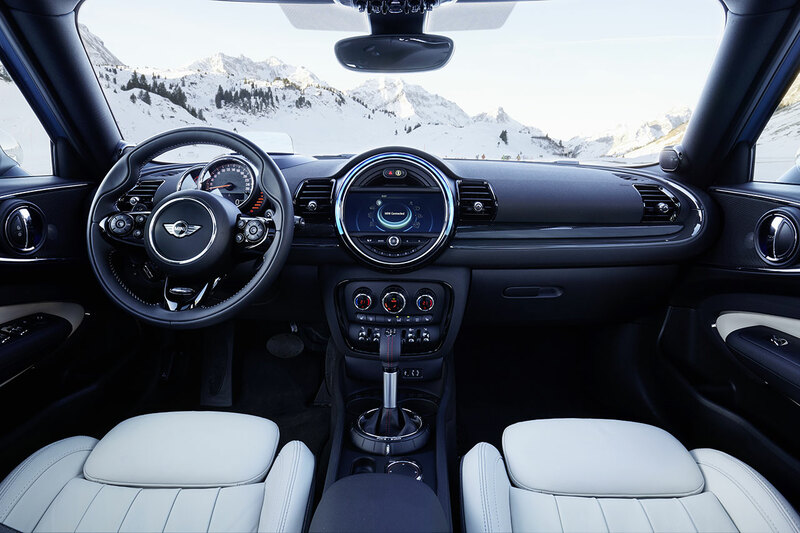 Offering 192 hp, the new MINI Cooper S Clubman ALL4 is combined with a 6-speed manual transmission as standard, and optionally with an 8-speed Steptronic transmission. It achieves fuel consumption of 40.9 mpg with the manual transmission (44.8mpg for automatic transmission) and has CO2 emissions of 159g/km (146g/km). The new MINI Cooper SD Clubman ALL4 features a 190 hp diesel engine with 400 NM of torque which is paired with the brand’s capable 8-speed Steptronic transmission as standard. Fuel consumption on the combined cycle is 58.9mpg with CO2 emissions of 126g/km. The new MINI Clubman ALL4 includes an exceptionally high specification, with the brand’s highly acclaimed Navigation System standard on all models. 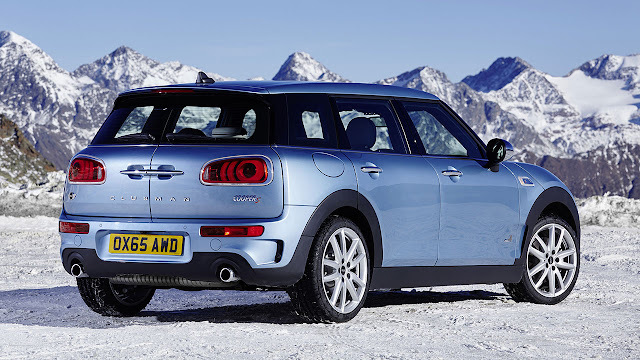 Furthermore, every MINI Clubman ALL4 also benefits from the MINI Excitement Package as standard, which features a projection of the brand logo on to the ground beneath the driver’s side door mirror when the car is opened and closed, as well as extended interior lighting. Production of MINI Clubman ALL4 has started at MINI Plant Oxford, with first deliveries at MINI retailers nationwide in April. MINI Cooper S Clubman ALL4: 4-cylinder petrol engine with MINI TwinPower Turbo Technology (turbo charging, direct injection, fully variable valve control, variable camshaft control), capacity: 1998 cc, output: 141 kW/192 hp at 5 000 rpm, torque: 280 Nm at 1 250 rpm (300 Nm with overboost), acceleration (0–62mph): 7.0 seconds (automatic: 6.9 seconds), top speed: 142mph (142mph), average fuel consumption*: 40.9mpg (44.8mpg), CO2 emissions*: 159 g/km (146 g/km), exhaust emission standard: EU6. MINI Cooper SD Clubman ALL4: 4-cylinder diesel engine with MINI TwinPower Turbo Technology (turbocharger with variable turbine geometry, common rail direct injection), capacity: 1 995 cc, output: 140 kW/190 hp at 4 000 rpm, max. torque: 400 Nm at 1 750 – 2 500 rpm, acceleration (0–62mph): 7.2 seconds, top speed: 138mph, average fuel consumption*: 58.9mpg, CO2 emissions*: 126 g/km, exhaust emission standard: EU6. The electronically controlled all-wheel drive system distributes drive torque between the front and rear axles depending on specific road conditions. This enables faster acceleration and increases agility when taking bends at speed. ALL4 also ensures utmost traction and optimised driving stability in all weather and road conditions. The latest version of the ALL4 all-wheel drive system has been designed to be compact and light-weight, therefore increasing efficiency. This means there is only a slight increase in fuel consumption and exhaust emissions compared to the respective front-wheel drive models. The drive power delivered by the engine via the manual or Steptronic transmission in the form of engine speed and torque is fed to the front axle differential. An integrated single-stage power take-off bevel gear diverts the power and relays it to a propeller shaft leading to the rear axle. Power transmission to the rear axle differential is continuously managed via a hang-on clutch. If necessary, the hang-on clutch can relay torque to the rear wheels within a fraction of a second by means of an electrohydraulic pump. Fast and precise reactive changes to road conditions are possible because the all-wheel drive system is connected to the Driving Dynamics System (DSC) which continuously calculates the ideal power distribution between the front and rear wheels. Not only are the wheel rotation speeds and the current longitudinal and lateral acceleration figures taken into account, but so is the road speed, accelerator position, engine torque and steering angle as well as the Driving Dynamics System (DSC) settings and the optional MINI Driving Modes. 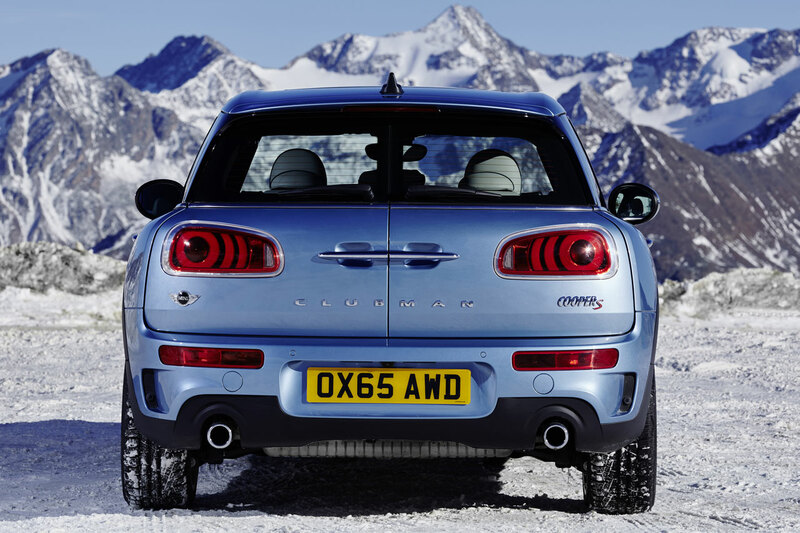 Based on this data, MINI Clubman ALL4 calculates the risk of wheel slip and can then anticipate and counteract any loss of traction, oversteer or understeer of the vehicle. Taking the form of an electronic locking function for the front axle differential, the standard Electronic Differential Lock Control (EDLC) improves traction when accelerating out of bends by means of selective braking. In DSC Off mode, this prevents spinning of the front wheel on the inside of the bend and transmits drive power to the outer front wheel instead. The Performance Control function is another standard feature that helps enhance agility in the MINI Cooper S Clubman ALL4 and the MINI Cooper SD Clubman ALL4 and works regardless of the DSC mode selected. Other functions of the driving dynamics system DSC include the anti-lock brake system (ABS), Electronic Brakeforce Distribution (EBD), Cornering Brake Control (CBD), the braking and drive-off assistant, the brake dry function and Fading Brake Support. DTC (Dynamic Traction Control) can also be activated when the vehicle is setting off in loose sand or deep snow. The latest generation 4-cylinder engines featuring MINI TwinPower Turbo Technology are responsible for distributing the power between the front and rear axle. Featuring a peak output of 192 hp, the 2.0-litre petrol engine in the new MINI Cooper S Clubman ALL4 is the most powerful engine in the range. With the standard 6-speed manual transmission, the new MINI Cooper S Clubman ALL4 accelerates in 7.0 seconds from standing to 62mph, while in conjunction with the optional 8-speed Steptronic transmission the standard spurt takes just 6.9 seconds. The top speed is 142mph in each case. These figures are combined with an average fuel consumption of 40.9mpg (automatic: 44.8mpg) and CO2 emissions of 159 (146) grams per kilometre (EU test cycle figures, dependent on tyre format selected). A turbocharging system with variable turbine geometry and common rail direct injection operates at a pressure of up to 2,000 bar inside the 2.0-litre diesel MINI Cooper SD Clubman ALL4 engine. The new MINI Cooper SD Clubman ALL4 combines the most powerful diesel engine ever installed in a MINI with the brand’s 8-speed Steptronic transmission as standard, achieving superb pulling power as well as exemplary fuel consumption figures and emissions. This enables the MINI Cooper SD Clubman ALL4 to sprint from standing to 62mph in just 7.2 seconds. The top speed is 138mph. These figures are combined with an average fuel consumption of 58.9mpg and CO2 emissions of 126 grams per kilometre (EU test cycle figures, dependent on tyre format selected). Innovative transmissions for performance and efficiency. The standard 6-speed manual transmission is characterised by low effort and short shift distances. A ‘rev matching’ function built into the manual transmission ensures jerk-free clutch engagement, thereby enhancing comfort when shifting down a gear. The optional 6-speed Steptronic sport transmission combines excellent efficiency with smooth yet fast gear changes. In manual mode it’s possible to change gear using shift paddles at the steering wheel. Furthermore, in conjunction with the MINI Navigation System the transmission is able to take account of the route profile in automatically controlling gearshifts. A complete set of safety features, innovative driver assistance systems, intelligent connectivity. In addition to the torsionally stiff, rigid and light-weight body structure, a complete set of standard safety features also contributes to the outstanding occupant protection of the new MINI Clubman ALL4. This extensive protection comprises of six airbags, 3-point automatic belts on all seats including belt tensioners and adaptive belt force limiters at the front, as well as ISOFIX child seat mountings at the rear. A tyre pressure display for each individual wheel is also included as standard. Meanwhile, impact absorbers and precisely defined deformation zones ensure optimised pedestrian protection. Optional driver assistance systems offered on the new MINI Clubman ALL4 serve to increase both safety and comfort. The MINI Head-Up Display which extends from above the steering column enables the driver to focus their concentration on the road. In addition to the cruise control with brake function, the Driving Assistant system is also available, featuring camera-based active cruise control and collision and pedestrian warning with brake function, high beam headlight assistant and road sign detection. Additional options include the Parking Assistant and rear view camera. Make Clubman Yours: High standard specification and options for every taste including atmospheric lighting, electrically adjustable seats and much more. With the MINI Yours Interior Styles option, the door trim design is highlighted via illuminated decorative strips. These can combined with interior trim finishers of various types and colours of the customers choosing. The MINI Excitement Pack features LED interior and ambient lighting which illuminates the cabin with a choice of selectable colours as well as an external light display activated when unlocking and locking the car using the remote key. The MINI logo is projected onto the ground for 20 seconds from a light source housed in the exterior mirror on the driver’s side. Over 50% of MINI Clubman customers are expected to choose the Chili pack which adds a host of additional extras to the car. These features include cloth/leather upholstery with heated sports seats, MINI’s comfort access system, park distance control, automatic air conditioning, LED headlights and LED fog lights among other features. 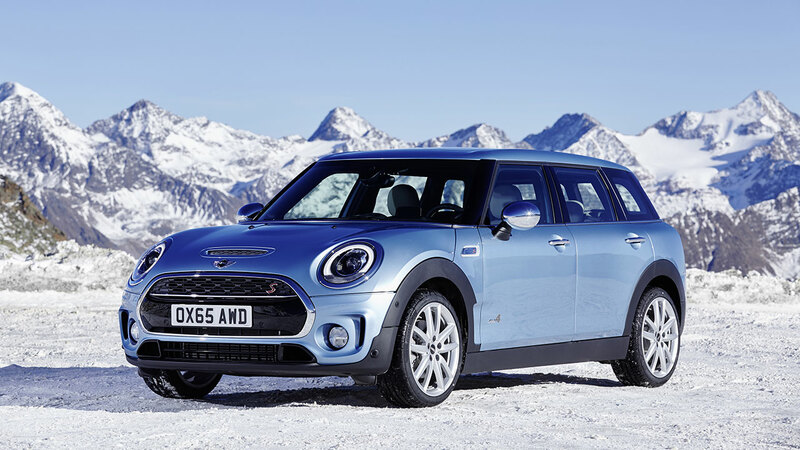 Chili pack is priced at £2,785 across all models – a 30% customer saving on MINI Cooper Clubman compared with selecting the options individually.